The Journal of the Times — asserting its cuteness with a quarter for scale. Post contributed by Jessica Janecki and the Holdings Management Team in Technical Services. The 3rd floor of Perkins, now a construction zone for the Rubenstein swing space. Our temporary home will house our reading room as well as work spaces for our Research Services, Collection Development, and University Archives staff. We will also to be able to keep a portion of our collections onsite during the renovation. The future temporary home of the Rubenstein Library Reading Room. Library bookshelves have been re-arranged to safely hold our large folios. As our regular readers know, moving out of our current space is no easy task. In addition to prepping the collections for the move, we also have to execute a safe and secure move in a short period of time with minimal impact on our researchers. We know we cannot do this without the help of professional movers, so we have been talking with and reviewing bids from various moving companies. 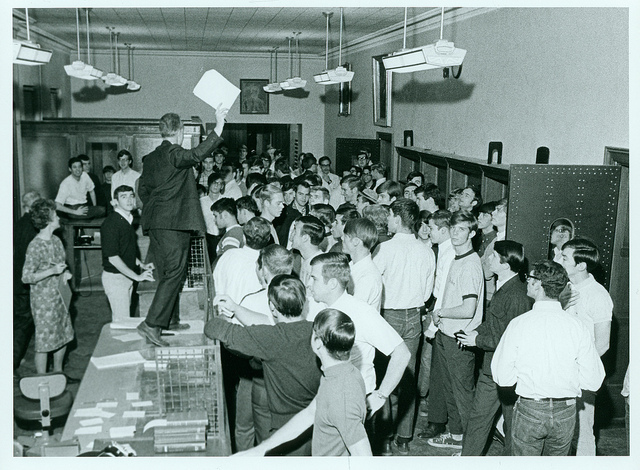 Back in 1969 when the library addition we now know as Perkins Library opened, the books were moved by fraternity brothers around campus. Some days I wish our move would be that simple. Although, after looking at the picture below of the 1969 move (from the Duke University Archives), I’m happy we will have the professionals involved. Moving Day for Perkins Library books, 1969. For more photographs of the Rubenstein renovation, visit the Library’s Flickr page. 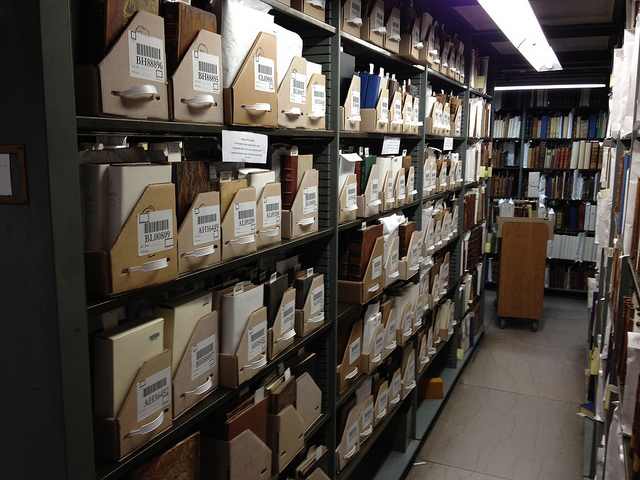 Post contributed by Molly Bragg, Collections Move Coordinator in the Technical Services Dept. 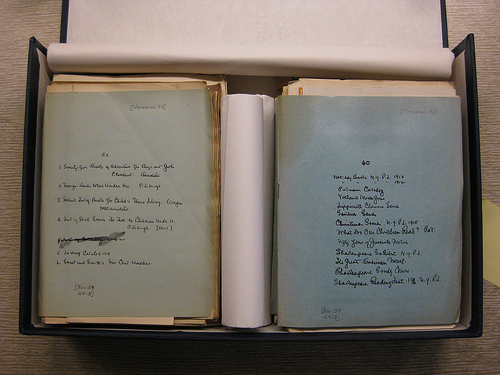 Preparing the Rubenstein Library holdings for the move requires the coordination of different departments completing different sets of tasks, sometimes in a specific sequence. For example, first our conservation team will go through a range of books and check their condition to see if they need any extra attention before moving. 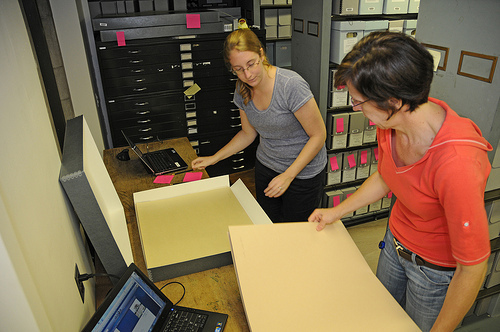 Next, our holdings management team comes through and looks for missing barcodes and checks the records of our titles. Lastly, students and staff come through and load volumes into trays that are moving offsite. So, how do we coordinate and communicate the efforts of all these different groups? Three words: color-coded post-it notes. 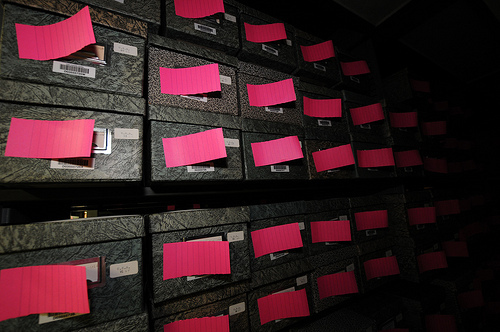 Conservation has tended to flag their efforts with yellow notes, holdings management uses blue, and everyone uses hot pink as signal that something is 100% “ready to move.” In some parts of the stacks, yellow post-its are also used to signal a manuscript box that needs to be reviewed for padding. 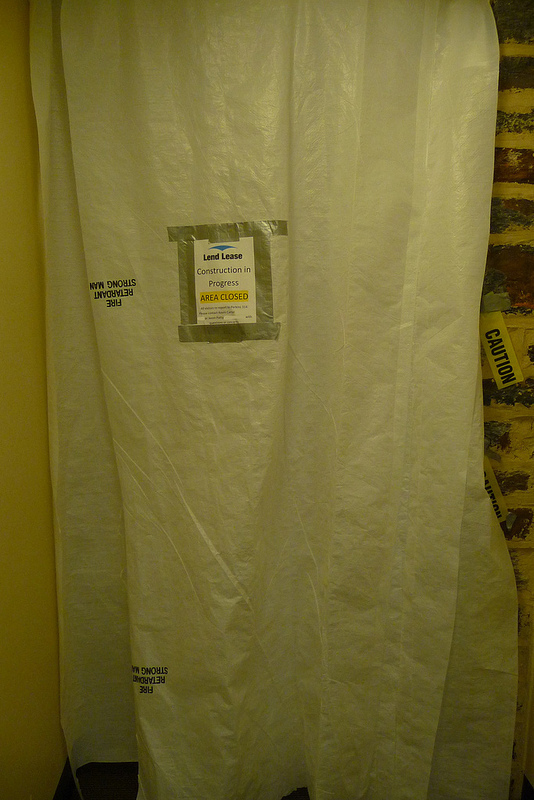 Also, book-traying teams use post-it notes to signal where they have left off on sealing Tyvek envelopes or duplicating barcodes in preparation for loading books into trays. We have other tools for tracking more preparation efforts, such as spreadsheets and access databases. The post-it note system is just as effective as these more sophisticated tools. Post-it notes are easy to understand, easy to update, do not require the use of technology, and are easy to access by people in different departments. Although we really rely on technology to make this move happen, it is nice to know that we can also rely on good old-fashioned paper tools. Plus our stacks are now very colorful, which makes for some lovely photos. Check out lots of pictures of the renovation on Flickr! 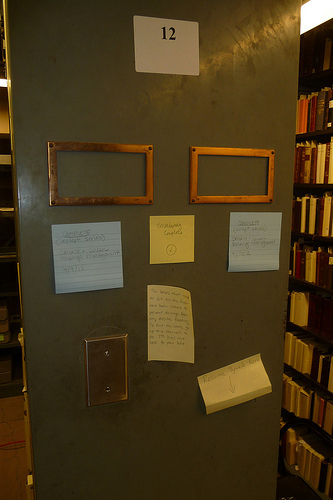 Post contributed by Molly Bragg, Collections Move Coordinator in Rubenstein Technical Services. 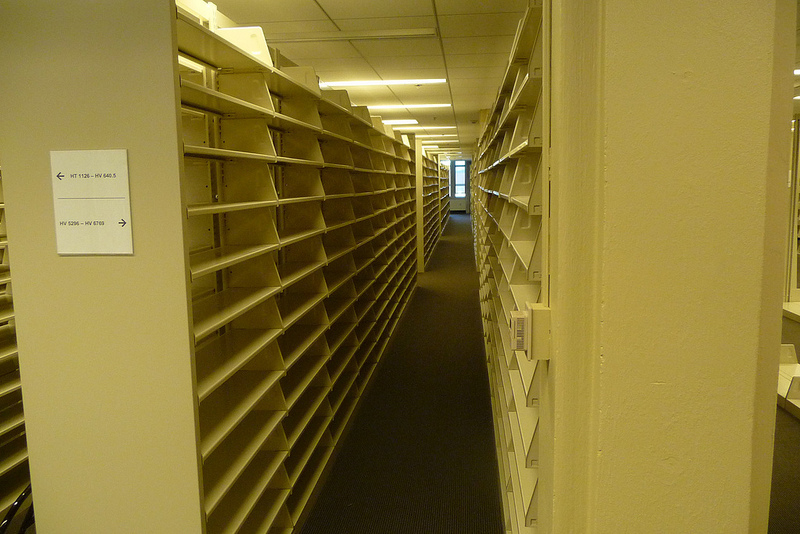 So, how do you move over 150,000 rare books? The Rubenstein Renovation team has been spending a lot of time thinking about, planning for, and generally fretting over how we are going to move portions of our priceless collection of rare books to the Library Service Center (LSC) in preparation for the renovation. Right now we are estimating that between 150,000 and 200,000 print items will be sent to LSC. 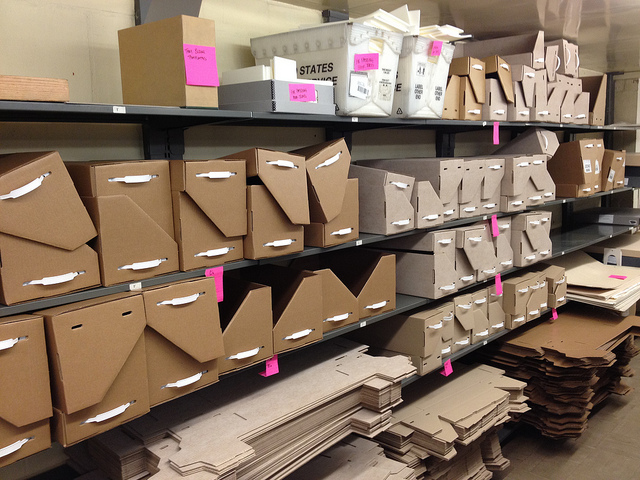 Books at the LSC are stored in book trays, which are made of cardboard and resemble a box that is open on two sides. We will be taking some of our books into our new enabling space as well, but these will not be packed into trays. In late 2011, we decided that we would load the books into book trays ourselves for two key reasons. First, loading the books ourselves will make processing the books into the LSC a much faster process, because our staff at LSC will not have to load the books. This means the books will be available to the public sooner. Secondly, we believe it will be safer for the books to travel off campus already loaded into trays as opposed to traveling on rolling book trucks. Empty book trays in various stages of assembly. This whole project was a very abstract plan floating out on the move horizon until the last few weeks, when we have started traying books in earnest. 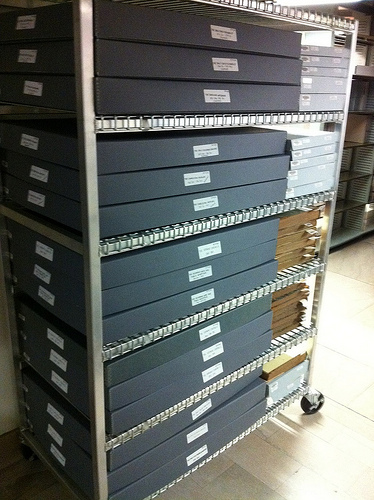 First, we had to find a place to store hundreds (eventually thousands) of flat and assembled book trays in the library. Second, loading books into trays is not nearly as simple as it sounds. The trays come in 5 sizes and each size has a high and low sub-size to account for book height. It is essential to match the books to the correct tray size for safe storage (books of varying sizes should not be loaded into the same tray). However there are many nuances to this process. For example, some of our books fit one size in width, but another in height and so on and so forth. Additionally the trays need to be full, but not over or under filled. 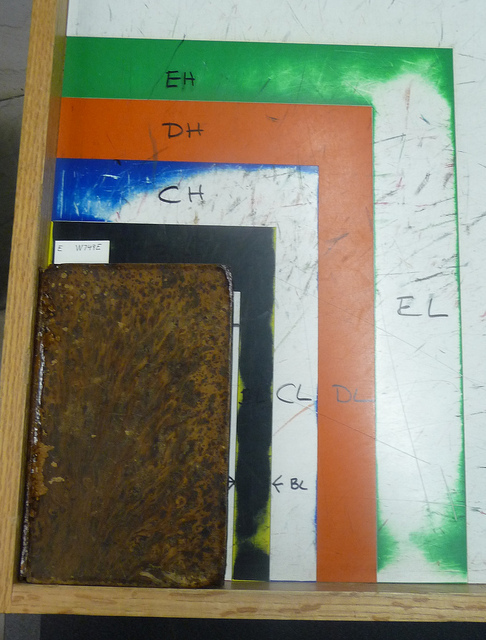 LSC measuring block, to help us figure out what tray size is best for each book. 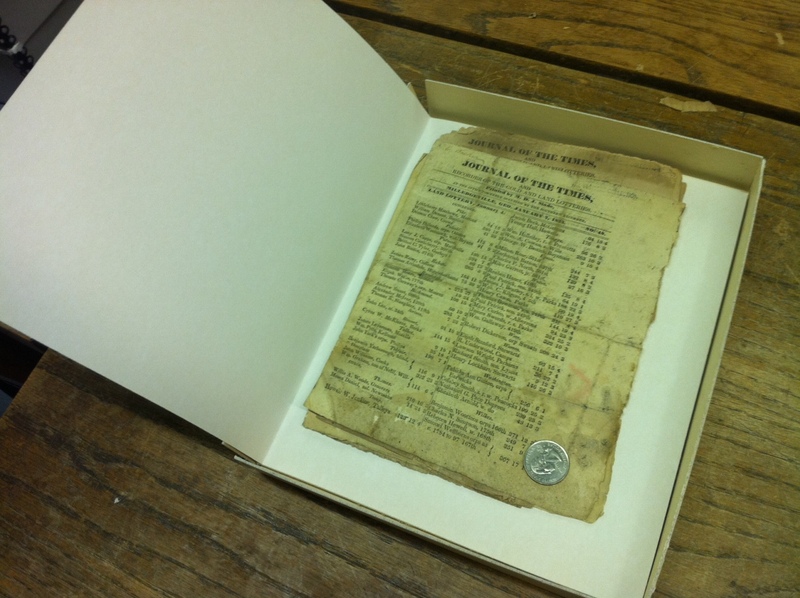 There are also a number of our books have been placed in Tyvek envelopes by our conservation team for safe keeping. As these books are trayed, we have to transfer call numbers and barcodes from the book flags to the envelope. Finally, we are also tracking the barcodes of each volume and tray for record keeping and easy retrieval after the move. All in all, this is a very involved process. Books that are trayed and ready to move. Currently the books are not scheduled to move to LSC until next winter, but we are starting now because as you can guess, book traying can be a time consuming process. Unfortunately, the downside of being so pro-active is that it will take us longer to retrieve our books when patrons request them. We do have strategies in place to minimize retrieval time, and we are extremely thankful for our patrons’ patience. This is a lot of work for everyone in the Rubenstein, but we believe this is the best way to move our books. The end result will be a collection that is safe, ready to move, and quite impressive-looking as well! 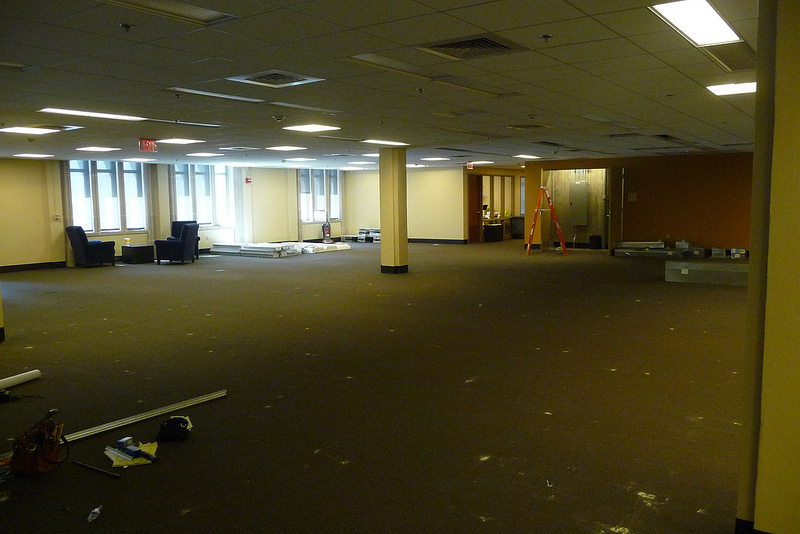 For more pictures of the Rubenstein move, check out our Rubenstein Renovation set on Flickr. Post contributed by Molly Bragg, Collections Move Coordinator. 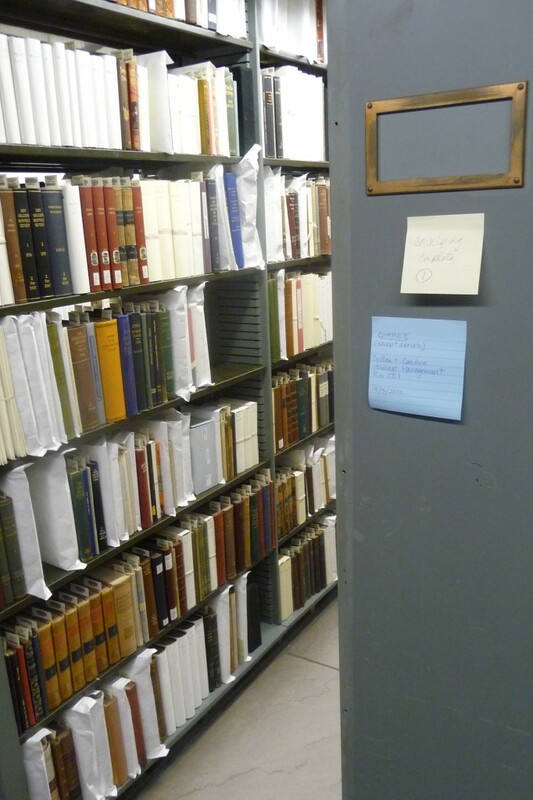 My part in the preparation for the Rubenstein’s upcoming renovation is to assist in making sure that all of our beloved materials have accurate records before the move. Imagine when you have moved to a new house or dorm room and realized you just can’t find that book from that library that’s overdue. Now multiply that scenario by thousands of volumes and the importance of our task becomes clear! Our Holdings Management Team members are going through the stacks systematically, checking records and barcodes on periodicals, reference items, pamphlets, and many, many sets of books. Out of the 13,000 volumes I personally have checked, over 2,000 needed to be fixed in some way. Our way of keeping track of various interdepartmental progress? Multi-colored post-it notes line the ends of shelf rows (ours are blue). It is always interesting to open a book and see the owner’s signature or personal bookplate. 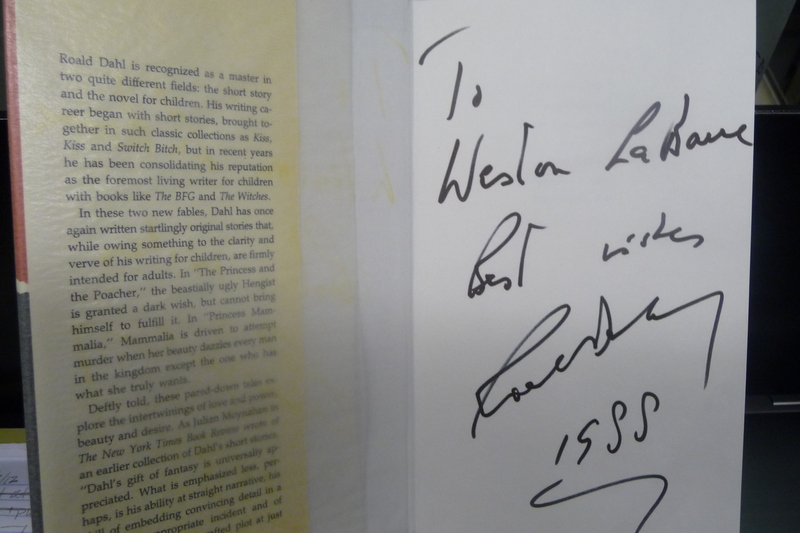 Today, I found a Roald Dahl book that was signed by the author in 1988. Once, I found a book on proper housekeeping that was signed to a friend on my birthday (except 200 years before I was born). I’m excited for the next 13,000 volumes! Cullen Cornett is a Holdings Management Assistant in the Rubenstein Technical Services Dept.